After the Success Shock picture, one either moves into denial, or intrigue. Denial means you probably aren’t ready this section, and intrigue: Well, you maybe would want to know which humans are most responsible for this shocking picture, and whether then denial is also a convenient strategy? 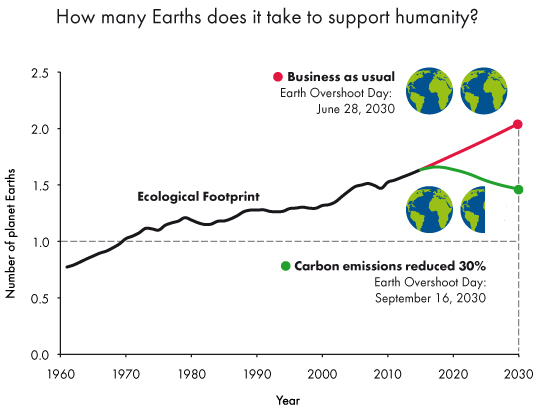 The graph below (courtesy from Global Footprint Network) not only provides some answers to the question of who are the most responsible, or leading the demand for more Earth’s? However the real shock concern is how the Global Development Initiative is driving all everyone to follow these ‘leaders’. 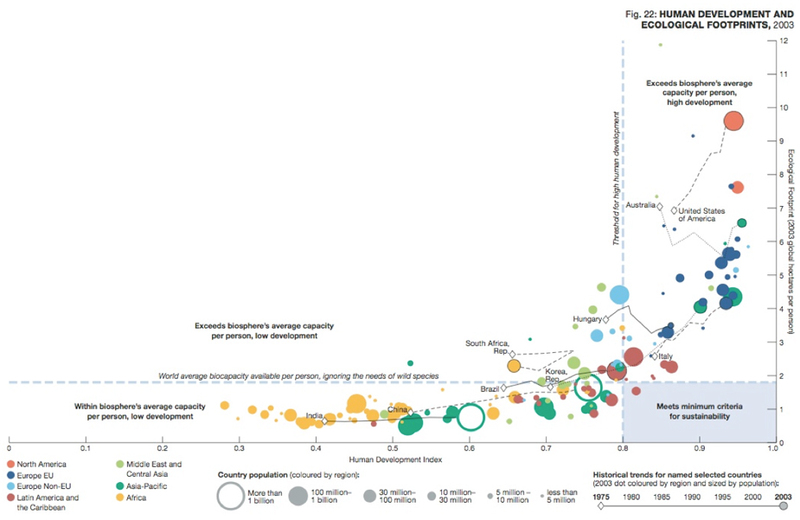 The Human Index is the accepted United Nations measurement for the level of a nation’s development. The individual elements that make up the index, have been derived from what is deemed Society Success, and most of the world humanitarian and are aimed at moving nations, communities, and individuals along this continuum towards 1.0 and a more developed state, aligned with the developed world’s Success. For a fully developed, One Point Zero world, all nations need to be in or around the shaded rectangle in the bottom right: There is just one! The shock is that almost all ‘The Leaders’ are orders of magnitude away from it and where the trail is presented are almost all continuing to move further away. The Definition of Success we have adopted for Human Society has a fundamental flaw in it, and the sooner we stop and find a new one the better! Footnote: Some of the concepts behind this simple picture painted above are complex, and I’d suggest for those wanting to understand and learn more, you visit the GFN website www.footprintnetwork.org for more information. I understand that personal beliefs and biases may conflict with ‘The Facts’, beliefs and values presented and that conflicting views are respected. From my extensive 12 year ‘on the ground’ research, and a vast amount of reading on the matter I have satisfied myself that the picture captured by Global Footprint Network is ‘The Truth’. I believe it is as close to ‘Fact’ as one can get within the accuracy of human understanding and scientific models. Whether each data point is 100% accurate is not the issue. The fact is that nations are way off where they should be, and the trend is showing we are getting worse every day!